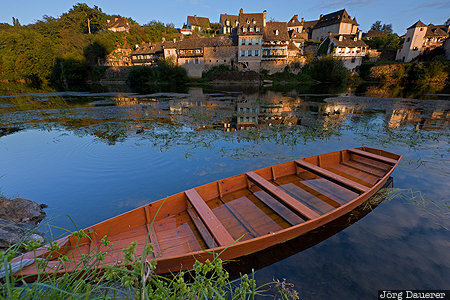 A small boat on the Dordogne river in the foreground and the houses of Argentat in the background illuminated by warm evening light. Argentat is in the region Limousin in the center of France. This photo was taken in the evening of a sunny day in September of 2015. This photo was taken with a digital camera.